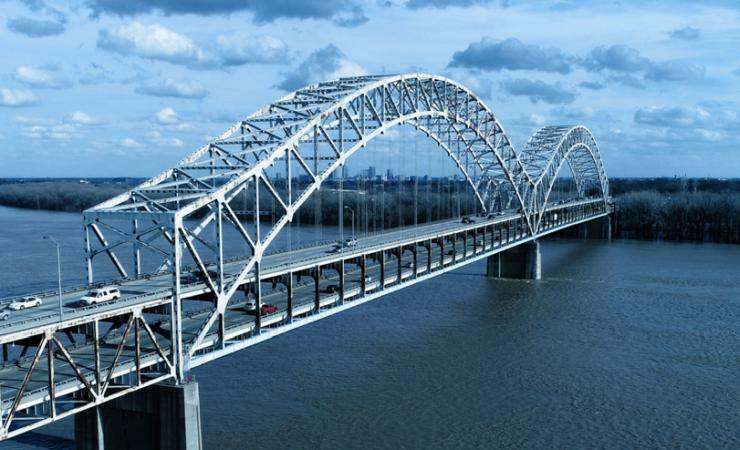 The US states of Kentucky and Indiana have initiated the first steps in an extensive project to extend the life of the 56-year-old Sherman Minton Bridge. Indiana Department of Transportation (INDOT) and Kentucky Transportation Cabinet have kicked off work on the project’s environmental study as an initial step in the development of the Sherman Minton Renewal project, which is expected to cost more than US$90 million. There are five bridge structures associated with the Sherman Minton crossing. The project includes replacement or refurbishment of all bridge decks, rehabilitation or replacement of structural steel elements and hanger cables, new lighting, drainage repairs and painting of steel components. The long-term repairs, along with normal preventive maintenance, will add up to 30-years of service life to the bridge. The project team is charged with identifying the best approach to construction. Multiple options will be explored, including partial closures and full closure of the bridge. The project extends from I-265 in Indiana to I-264 in Kentucky and includes the rehabilitation or refurbishment of three additional bridges on I-64 within the 4.8km corridor. A recommendation on the construction approach is expected towards the end of 2019. INDOT and KYTC have said that the contract will be on the basis of a design-build best value approach; price will not be the only criteria that will determine which team is selected. The project delivery method will invite innovative traffic management and constructability solutions that will help reduce construction time and impacts to the public. Construction is expected to begin in early 2021 and take two to three years to complete, depending on the final scope of the work and the approach to construction and closures.